When I was home visiting my parents, one of our family friends gave me a Thai cookbook as part of a graduation gift. I was pretty excited about this, since I love Thai food but don't know much about Thai cooking. As I was flipping through the book, I found myself especially drawn to the appetizer section, and decided to try a couple of the recipes this week. These green curry wontons were the first thing I made. 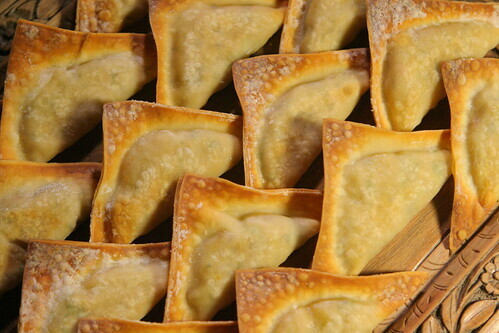 They have a flavorful potato and vegetable filling, kind of like a Thai twist on samosas. I decided to bake them instead of frying, which ended up being a good decision - the wontons ended up perfectly crispy at the edges but weren't greasy at all. These were pretty easy to make, and I could definitely imagine serving something like this next time I have a party. With the success of this recipe, I think it's safe to say that you'll be seeing more Thai recipes on this blog as I experiment with more recipes from my new book! For the best flavor, use a green curry paste that was made in Thailand. You should be able to find one at an Asian grocery store. Also, if your wonton wrappers are smaller or larger than the ones I used, you may need more or less than 20 to use up all the filling. These wontons don't really need a dipping sauce, but I enjoyed them with ketchup - it may not be traditional, but it tasted good! Preheat oven to 375 deg F. In a small bowl, mix together potato, peas, corn, cilantro, chile, lemongrass, soy sauce, fish sauce, and green curry paste. In a separate small bowl, mix together cornstarch and water until well blended. Lay one wonton wrapper on a flat surface and place a heaping teaspoon of the filling mixture onto the center of the wrapper. Brush a little bit of cornstarch mixture onto the edges of the wrapper, and fold the wrapper over the filling to make a triangle. Press the edges of the wrapper together to seal the wonton and place it on a large baking sheet. Repeat with the remaining wrappers and filling. Spray wontons with cooking spray, flip them over, and spray the other side. Bake in the preheated oven for 15 minutes, then flip the wontons over. Rotate the pan from front to back and bake for 8-10 minutes more, until wontons are browned and crisp at the edges. Wontons are best served immediately, but will stay crispy for a day or two stored in the fridge. Reheat in the oven before serving. I love thai flavors and had some fun thai ravioli at a restaurant in SF when I was there. These sound like they have similar components and flavors in them...need to try! Love the idea of green curry here - it's something I really should cook with more often! Love it! Thai food is great and curry is one of my favorites, especially green. I was able to find a Thai basil plant again this year, so as it grows I'll be able to make green curry paste from scratch again. I think I'll be trying these. sooo good! these look incredible! I love anything stuffed in a crispy wonton wrapper! OMG! These look soooo delicious!